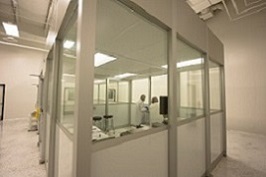 Velesco's analytical group occupies a state-of-the-art facility in Wixom, Michigan. With over 11,000 square feet, we are able to provide a wide range of services dedicated to early clinical development, such as drug formulation and analytical method development. Our full-time laboratory staff is highly-trained and qualified to employ the most stringent analytical laboratory testing methods, utilizing our array of instrumentation. Our analytical testing laboratories are equipped with fully automatic instrumentation, providing you with unsurpassed accuracy. Velesco's Research and Development Facility, and GMP Laboratory, located in Wixom, Michigan. Velesco's cGMP manufacturing group occupies a facility in Kalamazoo, Michigan. With over 10,000 square feet and 2 Class 10,000 clean rooms, we provide many cGMP clinical trials manufacturing, packaging, and release services. Velesco's GMP Manufacturing Facility, located in Kalamazoo, Michigan.